November | 2016 | GameXcess.net - Gaming News, Videos and Editorials! This announcement has certainly been a long time coming. When it was first announced as Final Fantasy Versus XIII nearly a decade ago, it wowed gamers with its gameplay and presentation. One entire gaming generation passed with very little news about the project, but when we hit the beginning of the newest console generation, Square Enix proudly revealed that Final Fantasy Versus XIII would appear on the newest gaming consoles…only it would now be called Final Fantasy XV. Today, I’m proud to announce the game is out on the Xbox One and PlayStation 4! Here’s the official launch trailer! Stay tuned to the site for more Final Fantasy XV content and news! Square Enix will be hosting a live stream of the game with Make a Wish in about fifteen minutes on their Twitch.TV Channel! Final Fantasy XV is out now on the Xbox One and PS4. It’s rare when we see fictional items on sale in the real world but today, that will happen. Some of you may remember when Fallout 4 launched in the US, Target retailers exclusively offered a real world version of the iconic Fallout beverage Nuka-Cola for a limited time. It was an enormous promotion which turned the limited beverage into a collector’s item! Today, Target has begun selling the Final Fantasy XV health item Wiz Energizing Elixir in their stores for a limited time. The beverage will be given free to anyone who picks up any version of Final Fantasy XV at Target while supplies last. It’s also for sale at a price of $2.99 US without a purchase of the game. If you want it get it now because this is a very limited run! The beverage is branded as an orange cream flavored soda and like it does in the game, promises two servings of Gusahi Greens! 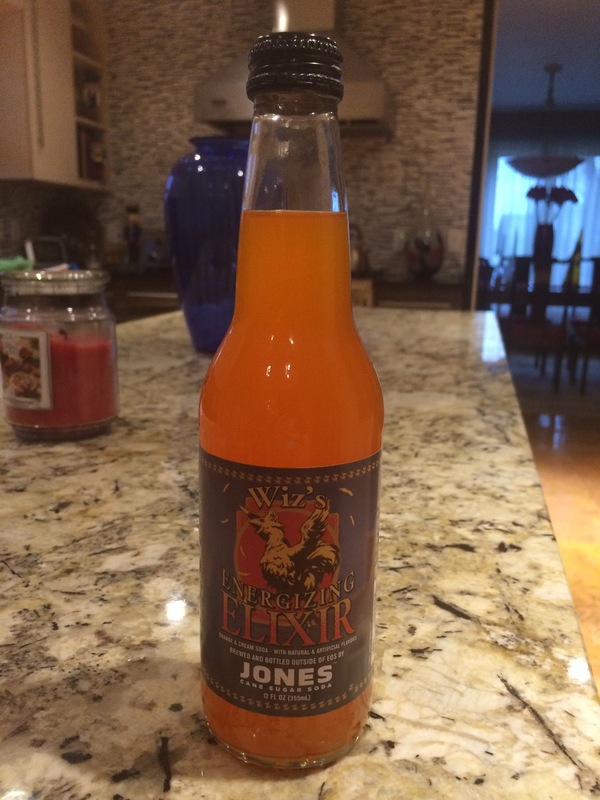 If you plan to drink the soda, make sure to save the bottle cap for redemption on Jones Soda’s Official Gear Site. Final Fantasy XV is out now for the Xbox One and PS4. Tonight at midnight, Final Fantasy XV is getting released worldwide! To celebrate the release of the game, Square Enix aired this trailer during tonight’s airing of Supergirl. If you’re planning to pick the game up at launch you need to watch this! Stand Together. What more can you say about this trailer? Stay tuned, we will have more Final Fantasy XV news coming all throughout the rest of the day! Final Fantasy XV is coming November 29th, 2016 to the Xbox One and PS4. Pokémon Sun and Pokémon Moon were released this past Friday and throughout this past weekend, GameStop, Toys R Us and Target stores across the US hosted major Pokémon events to celebrate. The stores were giving away a range of cool promo items including exclusive posters and TCG cards. So how did the events go? Watch and find out! Pokémon Sun and Pokémon Moon are out now exclusively for Nintendo 3DS systems. A few years ago, a friend of mine and I played through the PS2 classic Ico together. I had missed out on it when it was first released over a decade ago but I made sure to pick it up when it was rereleased on the PS3 with Shadow of the Colossus. However, since the release of Shadow of the Colossus in 2005, gamers have been waiting a very long time for Team Ico’s next game, The Last Guardian. Last night, I went to the movies with my girlfriend. Imagine my surprise to see this fantastic trailer before the feature film began. The Last Guardian is coming December 6th, 2016 exclusively to the PS4. That’s right, Pokémon is moving to the digital cable channel Disney XD! On December 5th, 2016 Disney XD will broadcast the next major Pokémon movie, and following its premiere we will get a preview of the show’s next season. If you ask me, I think this is a great decision. With the exception of new feature-film broadcasts, Cartoon Network never offered Pokémon a decent timeslot. Cartoon Network’s pre-Adult Swim schedule is dominated by shows like Teen Titans GO and The Secret World of Gumball, leaving little room for Pokémon. Heck, new episodes of the show would only air at the unforgivable time of 8am! That’s far too early for most adults, and far too late for kids who have to be ready early for school. It would have made more sense for them to show it again at a later time slot in the mid-afternoon. Here’s to hoping Disney XD offers Pokémon at more times. I still have one curiosity about this major announcement I would like to mention here. The Disney XD Channel has been willing to experiment with broadcasting major gaming events like last year’s Nintendo World Championships, I wonder if they would be willing to broadcast a major Pokémon tournament next. If online streaming views are any indicator, they would probably get great Neilson ratings if they were finally broadcast on TV. So make sure to catch all your Pokémon shows starting on December 5th on Disney XD. Pokémon Trainers worldwide will be happy to know that the two newest games from the seventh generation of Pokémon have been released. Take a look at some of the game’s new Pokémon and its exclusive new features. That’s not even the best news, because I have even better news to share! Two stores will be celebrating Pokémon Days this weekend. On Saturday, Target store across the US will be offering an exclusive Pikachu TCG Card and Poster from 11AM to 2PM. Toys R Us will be hosting their Pokémon Day on Sunday, and they’ll be giving out an exclusive Electabuzz TCG card, a Pikachu poster and Volume 2 of the Evolutions collector’s album. Pokémon Sun and Pokémon Moon are out now exclusively on the Nintendo 3DS systems. As I said earlier today, today marks fifteen years since the release of the original Xbox, but that means that today is also the anniversary of the release of the first MUST-have launch title for the Xbox, Halo. To celebrate the release of Halo: Combat Evolved, Halo‘s new developers at 343 Industries hosted a two hour Halo 5: Guardians live stream. If you happened to miss it, we’ve got the archived version of it below. Please enjoy! Today marks the fifteenth anniversary of the release of the original Xbox! So much has changed in the past fifteen years but Microsoft’s devotion to offering great exclusive games has not been changed a bit. In the past fifteen years, three succesful consoles have been released and it has been a perminant home to the legendary Halo franchise. I think my favorite memories from the console can be directly tied into several Halo game releases. The first major game release night I ever attended was for Halo 2, and it was nice to finally see I wasn’t the only gamer where I lived. Since then I’ve made sure to pick up every single Halo game at launch, because not only have they been consistently great but because I feel such a close personal connection to that property because of all my experiences playing it. So how are you planning to spend today? The team at 343 Industries is planning to play games of Halo 5: Guardians throughout the day! For me, I think I’m going to get back into playing Halo: The Master Chief Collection. Post a comment with your thoughts on the Xbox’s birthday and celebrate fifteen years of Xbox!